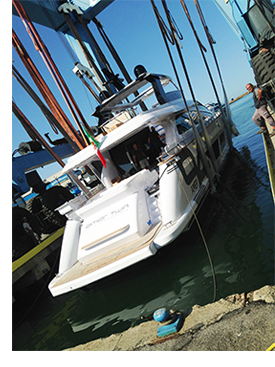 The new Amer 94 yacht is powered by twin Volvo Penta D13-IPS1350. The Amer 94 twin is fuel efficient, considerably lighter than contemporary yachts and promotes the use of environmentally-friendly materials. Nicknamed ‘innovation lab’, the new Amer 94 is a testament to the Italian yacht-builder’s enthusiasm for pioneering the use of cutting-edge products for the benefit both of customers and oceanic health. “Sustainability is important to our philosophy and we have been offering our contribution to the nautical industry for several years as we know that yacht-builders are important players in changing customers’ attitudes,” says Barbara Amerio, owner of Amer Yachts. The new Amer 94 is the fourth model in Amer’s 94ft series, and builds on the success of the previous vessels. The initial 2015 model, named ‘Save the Sea’, was the first European yacht of more than 90ft to use Volvo Penta’s innovative IPS propulsion – D13-IPS1200. Volvo Penta IPS delivers high power and performance with smaller engines compared to a traditional inboard shaft installation. The end result is efficiency gains, including reduced fuel consumption and emissions, as well as a decrease in overall weight onboard. This contributes to the ability to design a lighter yacht. A number of additional elements minimize the weight of the yacht, including the use of cork decking instead of teak, variable phase generators rather than traditional units, stabilizer fins instead of gyro-stabilizers, and light pantograph doors. The new Amer 94 is up to 20 tons lighter than comparative-sized competitors’ yachts – the equivalent of three large elephants. In addition, Amer has incorporated materials with a reduced impact to the environment in mind. These include airlite paint that reduces CO2 to purify air, high efficiency lithium batteries, eco-friendly submarine film instead of anti-fouling paint, a waste-water system for crew use, and a reduction of plastic components. Volvo Penta IPS is a fully integrated propulsion system, from the helm station to the propellers. In addition to offering reduced fuel consumption and fewer emissions, it provides unrivalled maneuverability and more space onboard thanks to its compact dimensions.